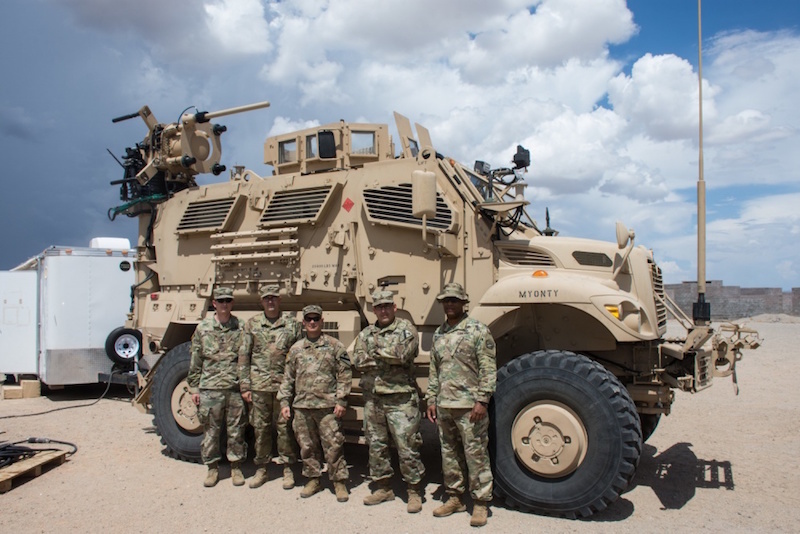 FORT HOOD, Texas --- The 1st Cavalry Division's 3rd Armored Brigade Combat Team "Greywolf" soldiers fielded the Army's new electronic warfare tactical vehicle recently. The new vehicle was developed to give Army electronic warfare teams the ability to sense and jam enemy communications and networks from an operationally relevant range at the brigade combat team level. "This effort will allow the ability for EW soldiers to influence future vehicle improvements and grow their knowledge," Army Lt. Col. Scott Schumacher, chief of the Rapid Equipping Force solutions team, said in a release. "This is an advanced EW technology that can provide the Army new offensive and defensive capabilities." The Greywolf team attended two weeks of training on the vehicle in Yuma, Arizona. The electronic warfare kit is installed on a four-wheel drive MaxxPro Dash, one of the multiple types of mine-resistant, ambush-protected armored vehicles. "It has never been used at the brigade level, so we have to really put it through its paces and see what its capabilities and limitations are," said Army Chief Warrant Officer 2 Alexander Torres, the brigade's electronic warfare technician. "We have to develop best-practices and [tactics, techniques and procedures] that will help future units as well as continue the development of a dedicated EW platform." Since the inception of brigade-level electronic warfare, electronic jamming had not been available. The new system is highly programmable, which allows the EW team to develop a program targeting the enemy's frequencies. "This is a huge benefit, because now we have it on our time instead of relying on our sister services to provide us with jamming capabilities and hoping it is available when we need it," Torres said. The new vehicle was developed as part of the Army's Rapid Equipment Fielding program, which identifies gaps that need to be filled and cannot wait on the traditional contracting route. This is just the first step in building a platform that will benefit the brigade, Torres said. "We had nothing, and now we have something, and I hope we continue to keep building on it," he added. "We need to make sure it is effective. If we go out there and just let it sit and collect dust and don't use it -- and [if we don't] make sure that it also enables the commander to maneuver his forces and gain the advantage in the electronic spectrum -- then really it is wasting a valuable resource." The Greywolf team will integrate the vehicle during its upcoming brigade evaluation.